Money Supply is an important indicator of economic activity. A slowdown in money supply growth hints the EU is facing the prospect of very low inflation or even deflation. 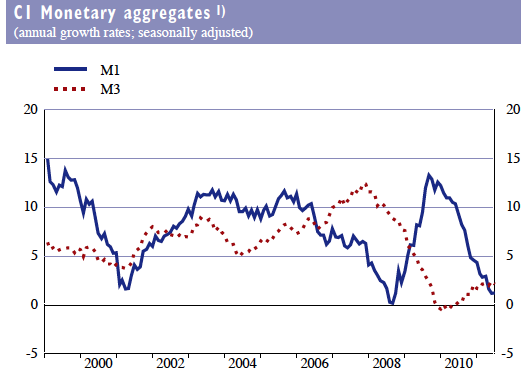 Since the start of 2010, the growth of M1 has fallen significantly for the Euro area. These figures show the whole Eurozone area, however, in the South, M1 figures are even worse. This fall in the Money Supply is a real cause for concern; it shows an economy heading towards economic slowdown and recession. It raises the possibility of deflation (once commodity prices stop rising). 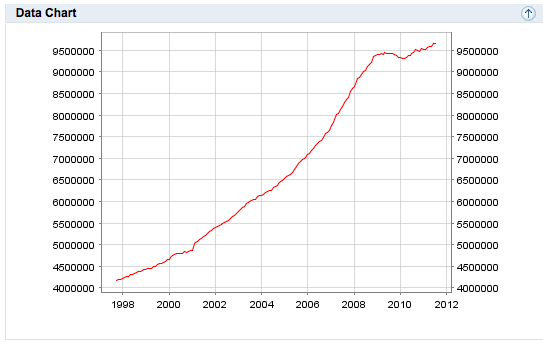 How will the EU be able to reduce Debt to GDP ratios when you have falling nominal GDP? Many countries in the Euro have been forced to cut spending as part of austerity packages. This fiscal restraint (which involves pay cuts and job losses) has led to lower growth. Strong Euro. Against the US dollar, the Euro has risen from 1 EUro to 1.2 US Dollar in March 2010, to the current level of 1 Euro to 1.4 US dollars. Loss of business and consumer confidence given on going problems. This graphs shows the usual growth rate in M3. This has strongly been checked since 2009.